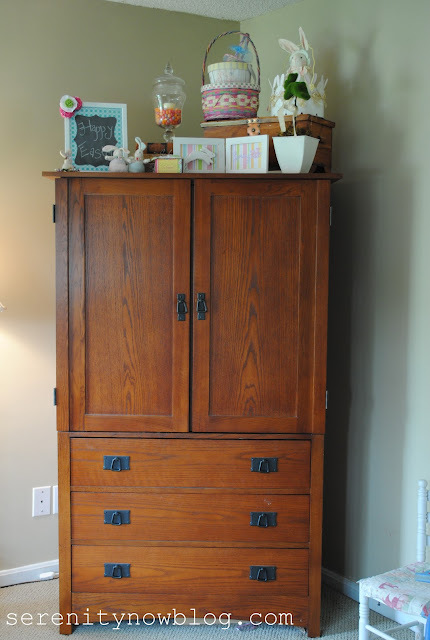 I was really, really hoping I'd have an awesome makeover project to share with you guys. But I'm waiting on a friend to help me complete the process...hopefully I'll have something cool to show you soon! 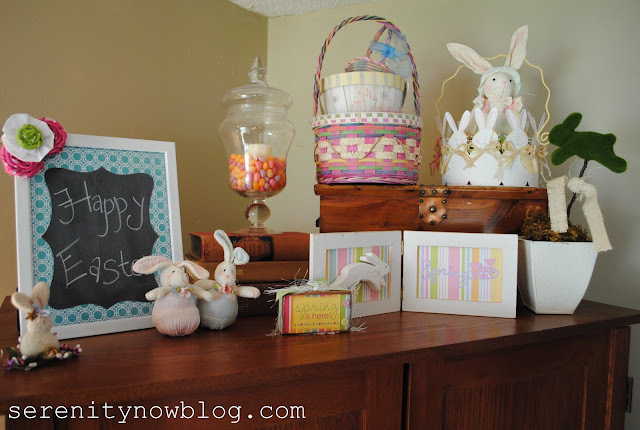 For today, I thought I'd share my very simple Easter decorations. Just like my Valentine's Day Decorations, I forced myself to stick to what was in my stash. The only purchase I made was a bag of the cheapest jelly beans T could find for me on his way home from work. 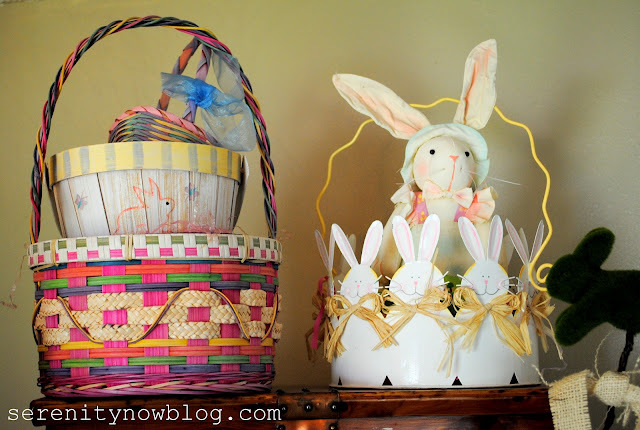 It's a little busy, but the girls get so excited to see the rabbits and the baskets, that I just kept adding to it. The "bunny on a stick" from Pier 1 was really really popular in blogland a few years back. I may the only one who still has one, but I love it! So...not much to see today, but I post stuff like this because I know there are others out there who get sidetracked by life the way I do. We shouldn't feel bad because our homes don't boast magazine-worthy vignettes for every holiday. What's more important to me this month is attempting to get everything back in order here at home and seeing how happy my girls are when they spot the bunnies in the family room! I do hope you'll pop in tomorrow because I have a wonderfully delicious dessert recipe to share with you...just in time for Easter weekend! As always, if you see something you like in this post, please click the "Pin It" button or share on Google+! 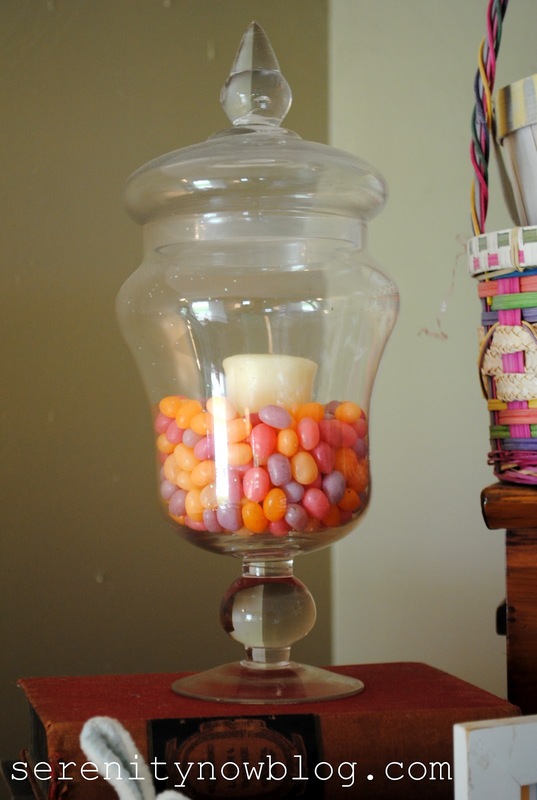 I actually dig the candleholder with the jelly beans inside -- so simple and beautiful. I'll be putting something similar on my Easter table for sure. 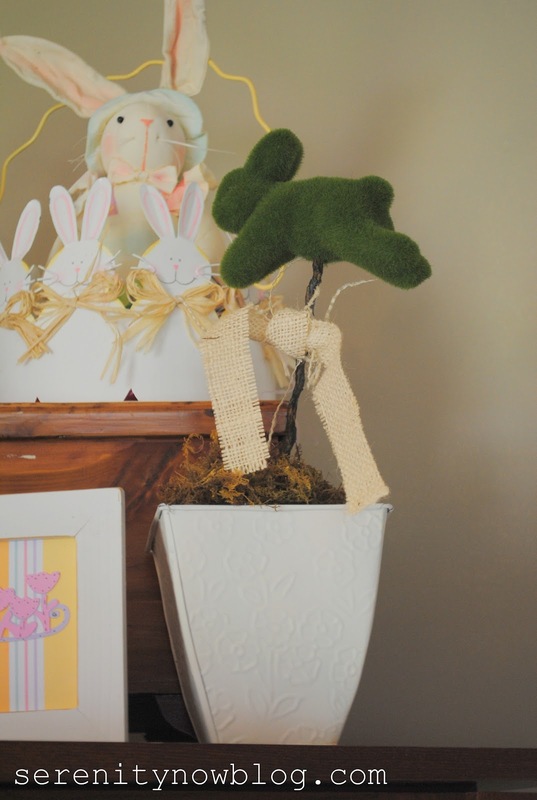 I like the topiary of Easter baskets. 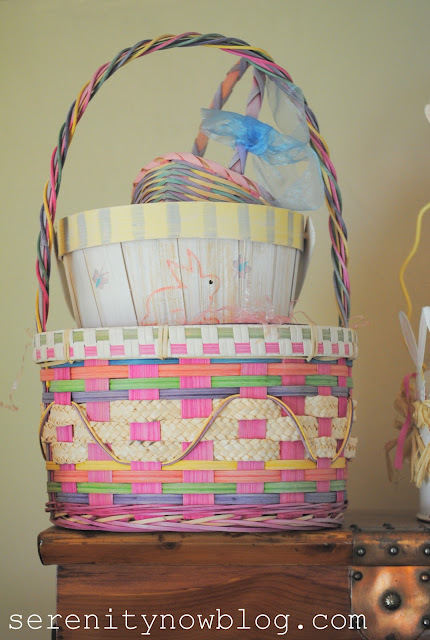 I have a ton of baskets I need to do something with. Love the jelly beans in the apothecary jar with the candle! Beautiful & simple! Thanks Amanda! I *love* that little moss bunny. Everything looks so cute and your pictures are looking awesome, Amanda! I love the way you use your armoire as a spot for your holiday decor. I have a mantel, but I don't really like to change it for holidays except Christmas. So I like to see other spots decorated--and I think this one is great! 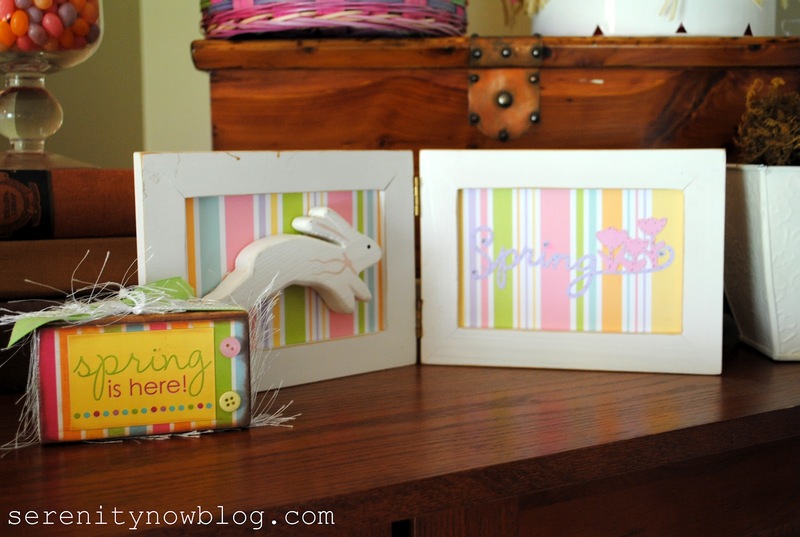 I can well imagine that your girls love this display of Easter goodies--it's fresh, springy, and fun! aw. i like the green bunny in mid flight. 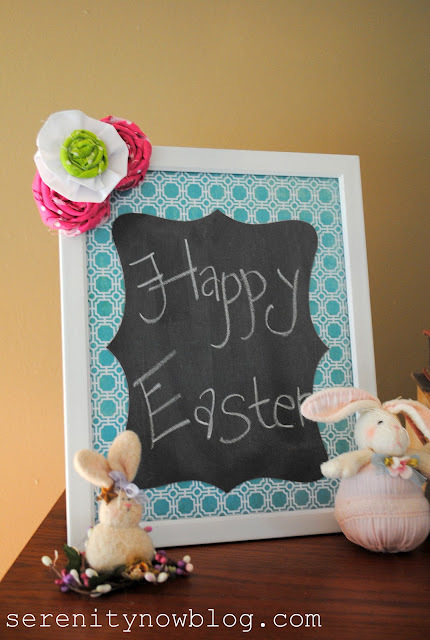 Love, love, love the picture frame chalkboard! So cute! Everything looks so cute. Having those jellybeans up high is exactly what I'd have to do else they'd be gone in a very short time! There's something to be said for simplicity! I love your candle surrounded with jelly beans, and the bunny on the stick may be a few years old, but I looove it! I wish I had seen it when it was for sale.